How do you create real characters? Do they arrive full blown in your head? Not for me. I have to do the work. Psychologists offer a couple ways to analyze personality and we can use those ways to create characters who are interesting and different from ourselves and each other. NOTE: I am not endorsing this site, but just offering it as an example of what is available. Ennea is a Greek word for nine, so this way of distinguishing personalities gives us a diagram of nine character possibilities. There is a Feeling Triad with the Helper, the Motivator and the Individualist. Next is the Thinking Triad of the Investigator, the Loyalist, the Enthusiast. Finally, is the Instinctive Triad of the Leader, the Peacemaker and the Reformer. Another popular personality paradigm is the Myers-Briggs temperaments. For this personality chart, there are four basic divisions, which can be combined to make sixteen personalities. The pairs of dichotomies are extrovert (E) v. introvert (I); sensing (S) v. intuition (N); thinking (T) v. feeling (F); and judgment (J) v. perception (P). For example, I am an INTJ (introvert, intuition, thinking, judgment). I’ve used these paradigms for personality before with various degrees of success. 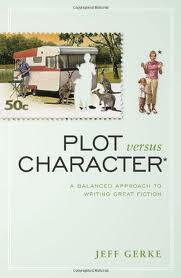 The reason I’m looking at them again, though is Jeff Gerke’s new book, Plot versus Character: A Balanced Approach to Writing Great Fiction. Gerke’s premise is that those who are great at plotting can also LEARN to do great characters; those who are great at character can LEARN to do great plotting. Hey, I love it! We know which camp we’re in, don’t we? So, let’s move into the middle camp and get good at both. Me? I need to get better at character! Gerke takes the Myers-Briggs personality types as a STARTING POINT for developing characters. Oh. Of course. We don’t want a stereotype, even if that stereotype is way better than our usual method of characterizing. Gerke’s book takes the basic stereotype and individualizes it with physical & natural attributes, major life events, likability, perceptions, speech habits, a specific inner journey for this story, the knot or major problem faced, the moment of truth (the epiphany), the opening state, the inciting incident, what escalates and what’s at stake in the final scene. Are you tired just reading that list? Yes! But it’s quick and relatively painless, partly because you START with a stereotype that already makes your character somewhat distinct. It gives you the inner journey, which is the core of the story. Wow! Great ideas from Gerke. Of course, the second half of the book is about “Marvelous Plots,” and is equally challenging. I’m just starting to work on a new novel and yes, I’m trying to work through many of these suggestions.